The Me 262 A-1a Schwalbe is a Rank V German jet fighter with a battle rating of 7.3 (AB) and 7.0 (RB/SB). It was in the game since the start of the Open Beta Test prior to Update 1.29. This aircraft is a true heavy fighter in every way. 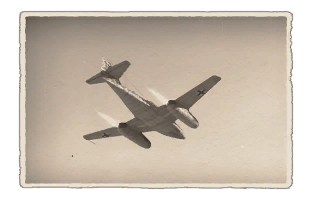 Thus, the following is guaranteed: bomber "box formations" fall apart under your heavy rocket bombardments, flying fortresses perish within seconds by this machine's mighty claws and the unusually low velocity of the German "sledgehammer" MK 108 cannons this aircraft wields will probably drive you insane. The MK 108 has insane damage potential, with the second greatest in-game burst mass of 14.52 kg/s (32.01 lbs/s) and the great explosive warhead "Minengeschoss" (=mine-shell) this weapon will vaporize aircraft, especially bombers. But every coin has a flip side and the "Sledgehammer" is no exception. The amazing rate of fire is exchanged with a very short barrel and small propellant charges, resulting in very bad ballistics. The MK 108 cannon fires the slowest shells with the greatest bullet drop in the game. Thus, the MK 108 makes no compromises, only and excels in the "extremes". As you might guess, the MK 108 is a very bad anti-fighter weapon particularly in a jet to jet combat. Bullet drop and slow velocity result in a severe difficulty leading shots at ranges above 300 meters (350 yds). In dogfights where both aircraft are constantly turning and changing direction, this trait gets even worse. The high speeds of jet battle push the necessary lead for hitting the target high and very far in front of the enemy. Training with this weapon system in a custom battle against random enemies is heavily advised. 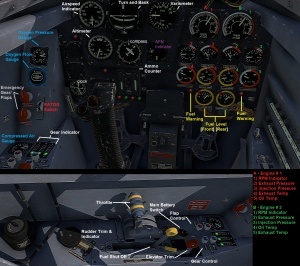 The MK 108 cannons have an ammo indicator in the cockpit, which is a bonus for sim pilots. It sits directly beneath the compass (the one with the little plane in the middle). A typical bar ammunition counter of the Luftwaffe. The left white column is for the two top auto-cannons. The right one is for the bottom two cannons, this bar is also taller than the left one as the ammo count is different for the two pairs. All four cannons are arranged in bundles of two mounted on the underside of the upper mounted in the nose of the aircraft. Two are outfitted with 100 RPG, while the other two have 30 RPG. As a heavy fighter, the 'Schwalbe' is not nimble, but neither are other first generation jets. Compared to them, the Me 262 is actually quite agile and possesses a speed, roll, and damage output advantage against certain adversaries. However, don't be fooled - this aircraft was the first operational jet fighter. Generally, anything 3 years older than the 262 outclasses it. Against them, the 262's turn rate is your only advantage. Except Meteors. Avoid combat with Meteors if possible however if engaged in a sea meteor or later variant, do not simply dive as it will only make your situation worse. Try alternating barrel rolls to force them to overshoot. Joystick users can try the classic trick of banking the aircraft about 120-180 degrees out of phase of the enemy aircraft with a positive G-load but as usual they will need to watch their altitude carefully. The 'Schwalbe' climb rate is actually not too bad as stock in 6.0-7.0 games but to climb well you need to be around 450 to 500 km/h for best climb rate which can be visually unappealing due to its low angle of climb. This in itself can be used to out-run and climb simultaneously as an advantage. Find a target already engaged in combat and busy or an enemy who is alone. Position yourself with either a speed or energy advantage in the enemy's blind-spot (where they would least expect you, attacking with the sun behind you is a good tactic). Proceed closer to the enemy aircraft with the energy advantage you hold. Launch a deadly surprise attack. Escape any other nearby enemies with a "zoom climb" or a continuation of the approach at your maximum speed. Once enough separation has been gained (3-5 km), regain energy by accelerating or climbing. Likewise, engaging a different target who has lower energy is an option. These tactics are virtually the same as used by the Fw 190 series and also works on all early jets (Meteor F 3, P-80, MiG-9, F2H, Kikka, R2Y2), etc. Against later jets, (Sea Meteor, La-15, F9F), it gets trickier as they can easily neglect any energy advantage you built up due to their superior acceleration. The approach suggested above will still work, but needs to be executed with even more caution. 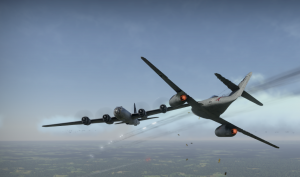 Having allies nearby to assist is also often mandatory in matches like these, as a single 262 bears little threat to Korean War jets. Against these superior foes, one of the 262's lesser strengths can be used - the turn rate. For a few turns, the Schwalbe will easily outmaneuver most Korean War jets, apart from the naval carrier jets like the F9F Panther and Seameteor. History's call. Seek and annihilate any heavy bombers with the impressive armament the Me 262 brings to the battlefield. Avoid getting shot at though! The 262's engines are weak and like to burn. If the engines catch on fire, throttle down and then shut off the engine (default "i") and go into a dive to gain speed. Rockets are also fun in this mode, as the Schwalbe has the option to carry up to 48 55 mm R4M rockets. Don't forget to set a detonation timer for the R4M missiles so they do not require direct hits. 600-800 meters is suggested. Bad acceleration and a high stall speed - usually not the traits wielded by an attacker, but the Schwalbe as two very convincing arguments on its side: R4M rockets and bad matchmaking. The 24 (48 second unlock) rockets can destroy light pillboxes, medium tanks and mini bases (~50 rocket impacts). Peculiar to note is the ability of the MK 108 to destroy light pillboxes. 60-80 shots are needed from a very low angle and from short distance. 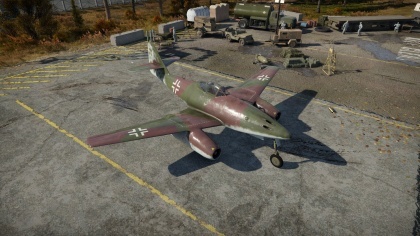 Also, the Me 262 can get dragged up to games where it will face Korean War jets. One could try, as an experienced pilot, to get the best out of the situation. Those who are not as skilled at ground attacking still benefit the team; if the match starts to take longer, a ground victory becomes an viable option. The same applies if the last enemy is hiding and the tickets start to count down. Going against other countries would bring out their jets. Other countries' first generation jets include the F-80A-5, Meteor Mk. 3, Vampire, MiG-9, Kikka and Yak-15. The Me 262 is the heaviest of them and thus reigns straight line kinetic energy retention at high speeds. Top speed goes to the F-80, followed by the MiG-9 and Meteor F.4. Not all is grim though! Both the Vampire and Yak-15 sit far at the end of the spectrum. The Sea Meteor has the best acceleration in the horizontal, although it will break apart before it can reach its top speed. 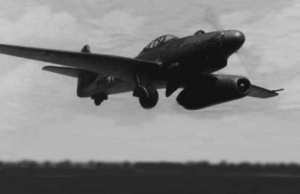 In the vertical, however, the weight and design of the Me 262 allows for the most rapid dive in this time era. Turn rate: DO NOT TURN IN JETS!, or heavy fighters like in this case. Pure horizontal maneuvers are reserved for emergency situations and should be avoided accordingly. As such, the Me 262 is often lacking in certain traits compared to its BR contemporaries. Always try to get a drop on the opponent and catch them by surprise rather than a straight-up dog-fight. The biggest issue of the Schwalbe is its bad acceleration across all speeds. Thus, Compressor and Engine upgrades have the highest priority. The cannons' stock belts are decent, but the high explosive content increases with the new ammo in Offensive 30 mm. Including them into the upgrade route is not a bad idea. The same applies for the rockets in the R1 modification. Being able to knock out bases (~40) or tanks (direct hit) with these warheads makes a long game much easier to win. New 30 mm cannons is an interesting upgrade choice as it increases accuracy above 300 meters (350 yd), but the MK 108 will still be unable to hit any at 500 meters (600 yd). Very exposed engines that are very susceptible to damage. First prototype was fitted with a Jumo 210 600 hp and a wooden propeller. This saved the test pilot on at least one occasion. This page was last edited on 20 February 2019, at 23:45.